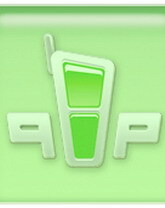 QIP PDA is a free unique closed source computer program for immediate cross-Internet communication. The basic functionality of QIP enables its users to see who else is online and available and then easily contact them with text messages in real time sent through a public server. Chat with award-winning IM+ Pro® within AIM®/iChat, MSN®/Windows Live™ Messenger, Yahoo!®, ICQ®, Jabber®, Google Talk™, MySpaceIM, Facebook® and even Skype™* regardless of location and mobile operator. Now with Twitter* support!